Work of removing debris started in all sections of the County. - Some members of Company B patrol Hancock Streets. 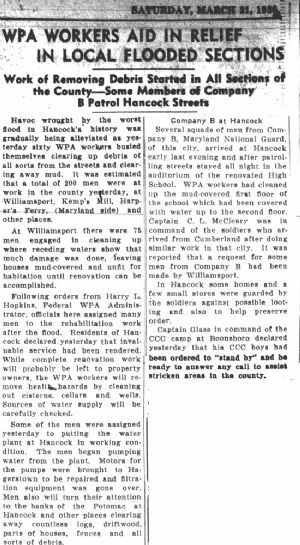 Havoc wrought by the worst flood in Hancock history was gradually being alleviated as yesterday sixty WPA workers bulled themselves clearing up debris of all sorts from the streets and clearing away mud. It was estimated that a total of 200 men were at work la the county yesterday, at Williamsport, Kemp's Mill, Harper’s Ferry (Maryland side) and other places. At Williamsport there were 75 men engaged in cleaning up where receding waters show that much damage was done, leaving houses mud-covered and unfit for habitation until renovation can be accomplished. Following orders from Harry L. Hopkins. Federal WPA Administrator, officials here assigned many men to the rehabilitation work after the flood. Residents of Hancock declared yesterday that invaluable service had been, rendered. While complete renovation work will probably be left to property owners, the WPA workers will remove health hazards by cleaning out cisterns, cellars and wells. Sources of water supply will be carefully checked. Some of the men were assigned yesterday to putting the water plant at Hancock in working condition. The men began pumping water from the plant. Motors for the pumps were brought to Hagerstown to be repaired and filtration equipment was gone over. Men also will turn their attention to the banks of the Potomac at Hancock and other places clearing away countless logs, driftwood, parts of houses, fences and all sorts of debris. Several squads of men from Company B, Maryland National Guard, of this city, arrived at Hancock early last evening and after patrolling streets stayed all night in the auditorium of the renovated High School. WPA workers had cleaned up the mud-covered first, floor of the school which had been covered with water up to the second floor. Captain C. L. McCleary was in command of the soldiers who arrived from Cumberland after doing similar work in that city. It was reported that a request for some men from Company B had been made by Williamsport. In Hancock some homes and a few small stores were guarded by the soldiers against possible looting and also to help preserve order. Captain Glass in command of the CCC camp at Boonsboro declared yesterday that his CCC boys had been ordered to "stand by" and be ready to answer any call to stricken area in the county.